The five couples in Yuletide Close send cards to some of their neighbours. Some of them told me who (apart from themselves) send cards. Charles Thomas receives the same number of cards as he sends. On Christmas Eve, he goes on a round tour for drinks. He delivers one of his cards, has a drink there, takes one of their cards and delivers it, has a drink there, takes one of their cards and delivers it, has a drink there, takes one of their cards and delivers it, has a drink there, collects the card from them to him and returns home, having visited every house in the close. Name the couples at 1-5 (for example: 1, Alan and Brenda Smith; 2, …). Enigma 1321 is also called “Christmas cards”. This completes the archive of Enigma puzzles from 1988. There is now a complete archive from the start of Enigma in 1979 to the end of 1988, and also from February 1999 to the final Enigma puzzle at the end of 2013. There are 1265 Enigma puzzles posted to the site, which is around 70.8% of all Enigma puzzles published. Happy New Year from Enigmatic Code! There are now 1,239 Enigma puzzles on the site, along with 61 from the Tantalizer series and 60 from the Puzzle series (and a few other puzzles that have caught my eye). There is a complete archive of Enigma puzzles published between January 1979 to September 1988, and from May 1999 up to the final Enigma puzzle in December 2013, which make up about 69.3% of all the Enigma puzzles published. Of the remaining 553 puzzles I have 125 left to source (numbers 900 – 1024). In 2018, 105 Enigma puzzles were added to the site (and 26 Tantalizers, 26 Puzzles, and 3 others, so 160 puzzles in total). Thanks to everyone who has contributed to the site in 2018, either by adding their own solutions (programmatic or analytical), insights or questions, or by helping me source puzzles from back-issues of New Scientist. A square field has its sides running north-south and east-west. The field is divided into an 8 × 8 array of plots. Some of the plots contain cauliflower. A line of plots running west to east is called a row and line of plots running north to south is called a column. John selects a row and walks along it from west to east, writing down the content of each plot as he passes it; he writes E to denote an empty plot and C to denote a plot containing cauliflower; he writes down EECECCEC. He repeats this for the other seven rows and writes down ECEECCCE, ECECEECC, ECCECCEE, CEECEECC, CECECECE, CECCECEE and CCECEEEC. The order in which John visits the rows is not necessarily the order in which they occur in the field. Similarly, Mark selects a column and walks along it from north to south, writing down the content of each plot as he passes it; he writes down EECECCCE. He repeats this for the other seven columns and writes down EECCEECC, ECECECEC, ECCECEEC, CEECCECE, CECECECE, CCEEECEC and CCECECEE. The order in which Mark visits the columns is not necessarily the order in which the occur in the field. Draw a map of the field, showing which plots contain a cauliflower. Enigma 1248 was also called “Rows and columns”. There are now 1200 Enigma puzzles on the site (although there is the odd repeated puzzle, and at least one puzzle published was impossible and a revised version was published as a later Enigma, but the easiest way to count the puzzles is by the number of posts in the “enigma” category). There is a full archive of Enigma puzzles from Enigma 1 (February 1979) to Enigma 461 (May 1988), and of the more recent puzzles from Enigma 1048 (September 1999) up to the final Enigma puzzle, Enigma 1780 (December 2013). Which means there are around 591 Enigma puzzles to go. Also on the site there are currently 53 puzzles from the Tantalizer series, and 50 from the Puzzle series, that were published in New Scientist before the Enigma series started. 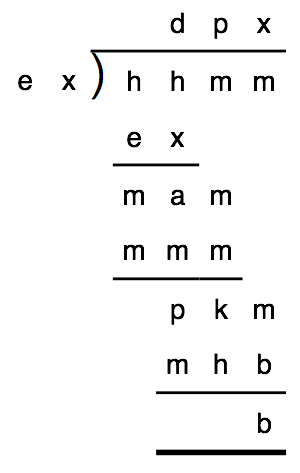 In the following division sum, letters are substituted for digits. The same letter stands for the same digit wherever it appears, and different letters stand for different digits. Rewrite the sum with letters replaced by digits. This puzzle brings the total number of Enigma puzzles on the site to 1192, which means there are now more than 2/3 of all Enigma puzzles published in New Scientist on the site. There is a full archive of puzzles from October 1999 to the final Enigma puzzle in December 2013 (728 puzzles), and also a full archive from the first Enigma puzzle in February 1979 up to this puzzle from April 1988 (462 puzzles — there were sometimes multiple puzzles at Christmas). This leaves around 600 puzzles to be posted. Thanks to the ongoing efforts of Hugh Casement I have been able to acquire the text for most of these remaining puzzles (I have 134 left to source), so I can continue to keep posting them. There are also 48 puzzles on the site from the Puzzle sequence (with 43 left to go), and 51 puzzles from the Tantalizer sequence (I think I will be able to source around 268 more of these). Happy Puzzling! You play this game by first drawing 20 boxes in a continuous row. You then draw a star in each box in turn, in any order. Each time you draw a star you earn a score equal to the number of stars in the unbroken row [of stars] that includes the one you have just drawn. Imagine that you have already drawn eleven stars as shown below, and you are deciding where to place the twelfth. Drawing the next star in box 1 would score only 1 point, in box 11 it would score 2 points. A star in box 2, 5 or 6 would score 3 points, and in box 9, 12 or 19 it would score 4 points. Drawing the star in box 16 would score 6 points. Your objective is to amass the lowest possible total for the 20 scores earned by drawing the 20 stars. What is that minimum total? This puzzle completes the archive of Enigma puzzles from 2000. There are now 1169 Enigma puzzles available on the site. There is a complete archive from the beginning of 2000 until the end of Enigma in December 2013 (14 years), and also from the start of Enigma in February 1979 up to January 1988 (10 years), making 24 years worth of puzzles in total. There are 623 Enigma puzzles remaining to post (from February 1988 to December 1999 – just under 11 years worth), so I’m about 62% of the way through the entire collection. Enigma 442b: Oh yes I did! Oh no you didn’t! After our successful pantomime production in which I played the leading lady, I gave my little costarring helpers some gifts from a big bag of different trinkets, and they each got a different number and none were left. To make it fairer I gave each helper 10p for each gift that he didn’t get and deducted 40p for each gift that he did get, but that still gave each of them some 10p coins as well as some gifts. It cost me £12.60 in addition to the gifts. What was the highest number of gifts received by any helper (that little fellow got less than 50p cash)? What part was I playing? This puzzle completes the archive of Enigma puzzles from 1987. There is now a complete archive from the start of Enigma in February 1979 to the end of 1987, and also from February 2000 to the final Enigma puzzle in December 2013. Making 1162 Enigma puzzles posted so far, which means there are about 626 left to post. There are now 1,134 Enigma puzzles on the site, along with 35 from the Tantalizer series and 34 from the Puzzle series (and a few other puzzles that have caught my eye). There is a complete archive of Enigma puzzles published between January 1979 to September 1987, and from May 2000 up to the final Enigma puzzle in December 2013, which make up about 63.3% of all the Enigma puzzles published. Of the remaining 654 puzzles I have 152 left to source (numbers 891 – 1042). I have continued to maintain the enigma.py library of useful routines for puzzle solving. In particular the SubstitutedExpression() solver and Primes() class have increased functionality, and I have added the ability to execute run files, in cases where a complete program is not required. The SubstitutedDivision() solver is now derived directly from the SubstitutedExpression() solver, and is generally faster and more functional than the previous implementation. I’ve also starting putting my Python solutions up on repl.it, where you can execute the code without having to install a Python environment, and you can make changes to my code or write your own programs (but a free login is required if you want to save them). Thanks to everyone who has contributed to the site in 2017, either by adding their own solutions (programmatic or analytical), insights or questions, or by helping me source puzzles from back-issues of New Scientist. “Well, it’s going to be a square in the form of an enormous equilateral triangle”, was the reply. Kugelbaum’s mind began to tick over. How many slabs will there be in the completed array? This puzzle brings the total number of Enigma puzzles on the site to 1,100 (and by a curious co-incidence on Monday I posted Enigma 1100 to the site). This means there are (only!) 692 Enigma puzzles remaining to post, mostly from the 1990s. There is a full archive of puzzles from the inception of Enigma in February 1979 up to May 1987 (this puzzle), and also from September 2000 up to the end of Enigma in December 2013. Happy puzzling! Albion, Borough, City, Rangers and United played a tournament in which each team played each of the other teams once. Two matches took place in each of five weeks, each team having one week without a match. One point was awarded for winning in the first week, 2 points for winning in the second week, 3 points for winning in the third week, 4 points for winning in the fourth week and 5 points for winning in the fifth week. For a drawn match each team gained half the points it would have gained for winning it. At any stage, teams that had gained the same number of points were regarded as tying. After the first week A led, with B tying for second place. After the second week B led, with C tying for second place. After the third week C led, with R tying for second place. After the fourth week R led, with U tying for second place. After the fifth week U had won the tournament with more points than any of the other teams. (1) Which team or teams finished in second place after the fifth week? (2) Give the results of Albion’s matches, listing them in the order in which they were played and naming the opponents in each match. This completes the archive of Enigma puzzles from 2001. There are now 1065 Enigma puzzles on the site, the archive is complete from the beginning of Enigma in February 1979 to January 1987, and from January 2001 to the final Enigma puzzle in December 2013. Altogether there are currently 59.5% of all Enigmas published available on the site, which leaves 726 Enigmas between 1987 and 2000 left to publish. Delivering Christmas presents is not an easy task and Exe-on-Wye has grown to be so populous that it is hardly surprising that this year Santa Claus decided to delegate the delivery to his minions. Thanks to some failure in communication, however, instead of each house receiving one sack of presents, each of his helpers left a sack at each and every house. The number of sacks that should have been delivered happens to be the number obtained by striking out the first digit of the number of sacks delivered. When Santa Claus discovered this, he was not pleased. “Things couldn’t be worse!” he groaned. “The number of sacks you should have delivered is the largest number not ending in zero to which the addition of a single digit at the beginning produces a multiple of that number”. And he disciplined the unhappy helpers. But for each unhappy helper there were many happy households in Exe-on-Wye on Christmas morning. Can you say how many unhappy helpers and how many happy households? This puzzle completes the archive of Enigma puzzles from 1986, and brings the total number of Enigma puzzles on the site to 1,058. There is a complete archive from the start of Enigma in February 1979 to the end of 1986, as well as a complete archive from February 2001 to the end of Enigma in December 2013, which is 59% of all Enigma puzzles, and leaves 733 Enigma puzzles left to publish. I have also started to post the Tantalizer and Puzzle problems that were precursors to the Enigma puzzles in New Scientist, and so far I have posted 16 of each. In total there are 90 Puzzles (which I can get from Google Books) and 500 Tantalizer puzzles (of which the final 320 are available in Google Books). There are now 1,028 Enigma puzzles on the site (plus a few other puzzles). There is a complete archive of all puzzle published from January 1979 to September 1986 and also from May 2001 to December 2013, which is about 57.5% of all Enigma puzzle published in New Scientist and leaves around 760 puzzles to add to the site. I have continued to maintain the enigma.py library (in particular I added some routines to help in solving football problems with letters substituted for digits in score tables, and for solving general Alphametic problems). I wrote up some notes on the solving of Alphametics using Python here and here, and the SubstitutedExpression() class in enigma.py can now be used to solve many Enigma problems directly. Since switching to posting puzzles on Monday and Friday I have also added Wednesday Bonus Puzzles, which are posted on Wednesdays (naturally), if I have the time. Unless there is a particularly interesting puzzle that’s caught my eye that week I will alternate posting Tantalizer (set by Martin Hollis) and Puzzle (set by Eric Emmet) problems, which are the predecessors of the Enigma puzzles in New Scientist. (Although Eric Emmet seems to like puzzles involving substituted addition or division sums, and football problems a bit too much for my liking). Thanks to everyone who has contributed to the site in 2016, either by adding their own solutions (programmatic or analytical), insights or questions, or by helping me source puzzles from back-issues of New Scientist. He slept on the the problem and gave me the answer next morning. (A wrong-angled triangle is of course the opposite of a right-angled triangle. Instead of two of its angles adding up to 90°, it has two angles differing by 90°). There are now 1000 Enigma puzzles on the site, with a full archive of puzzles from Enigma 1 (February 1979) up to this puzzle, Enigma 364 (June 1986) and also all puzzles from Enigma 1148 (August 2001) up to the final puzzle Enigma 1780 (December 2013). Altogether that is about 56% of all the Enigma puzzles ever published. I have been able to get hold of most of the remaining puzzles up to the end of 1989 and from 2000 onwards, so I’m missing sources for most of the puzzles originally published in from 1990 to 1999. Any help in sourcing these is appreciated. There are now 923 Enigma puzzles on the site. There is a complete archive of all puzzles published from January 1979 – September 1985 and also from May 2002 – December 2013. Which is about 52% of all Enigma puzzles published in New Scientist, and leaves around 860 puzzles to add to the site. During 2015 I switched to posting puzzles twice a week (on Monday and Friday, with the occasional extra posting on Wednesdays if I had something interesting to post), so there are around 8 years worth of puzzles to go. Thanks to everyone who has contributed to the site in 2015, either by adding their own solutions (programmatic or analytical), insights or questions, or by helping me source puzzles from back-issues of New Scientist. Here is the 2015 Annual Report for Enigmatic Code generate by WordPress. The new method of rewarding goals scored in football matches is a great success. And some people say that the goals have increased not only in quantity but also in quality. In this method 10 points are awarded for a win, 5 points for a draw and 1 point for each goal scored. In a recent competition between 4 teams (A, B, C and D), A got 5 points, B got 35 points, C got 20 points, and D got 4 points, after some — or perhaps all — of the matches were played. Not more than 10 goals were scored in any match and that number was only scored in one. Each side scored at least 1 goal in every game. What was the score in each match? It’s now 4 years since I started the Enigmatic Code site, and we have 916 Enigma puzzles on the site, which is just over half the total number of Enigma puzzles published in New Scientist between 1979 and 2013. There is a complete archive from the very first Enigma puzzle in January 1979 up to August 1985, and from June 2002 to the final Enigma puzzle in December 2013. I aim to keep adding puzzles as long as I am able to source them. I currently need to get puzzles from #545 (January 1990) to #1154 (October 2001), along with #1166 (22nd? December 2001), #1176 (2nd March 2002), #1181 (6th April 2002) and #1186 (11th May 2002), (altogether around 600 puzzles), so I shall have to try and get to a reference library to get access to back issues of the magazine. Thank you to everyone who has joined in by sharing their own solutions and insights. In the following football table and addition sum, letters have been substituted for digits (from 0 to 9). The same letter stands for the same digit wherever it appears, and different letters stand for different digits. (1) The four teams are eventually going to play each other once, or perhaps they have already done so. With one exception, all the matches were won by a margin of only one goal. (Two points are given for a win and one point to each side in a drawn match). Find the scores in the football matches, and write out the addition sum with numbers substituted for letters. This is the 900th Enigma puzzle to be posted to the site. The archive currently contains Enigmas 1 – 314 (Feb 1979 – Jun 1985) and Enigmas 1199 – 1780 (Aug 2002 – Dec 2013). The ages of George’s four daughters add up to 70. Amanda says that the exact figures are 8, 16, 21, and 25. But Brenda says that Celia is 15. Delia, on the other hand, says that Celia is 18. This is all very confusing, until you know about a strange family habit. It is to state one’s own age correctly but to overstate the age of anyone older and to understate the age of anyone younger. Even after making all possible deductions so far, you cannot work out the age of each daughter. For that you need a bit more information, for instance the number of years separating Belinda and Celia. Please supply the name and age of the four. There are now 894 Enigma puzzles on the site, and I think this is around half of all the Enigma puzzles published in New Scientist, from Enigma 1 in February 1979 to Enigma 1780 in December 2013. To help me keep on top of posting the remaining Enigma puzzles I’m going to change the posting schedule to two puzzles a week, one on Friday and one on Monday. Which means, if I can keep sourcing the puzzles, I will have enough to last another 8.6 years! In the following division sum, some of the digits are missing and some are replaced by letters. The same letter stands for the same digit whenever it appears, and different letters stand for different digits. This puzzle brings the total number of Enigma puzzles on the site to 890. Since the final puzzle was Enigma 1780 you might expect that we now have 50% of all Enigma puzzles ever published available in the archive. However since there are sometimes multiple puzzles published with the same number (typically at Christmas) I don’t think we’re quite there yet. But I’ll be marking the “half-way” milestone sometime next week. Triangulo, the world-famous Cuban cubist, has created five boxes, each of which contains a number of cubes of the same colour, but with a different colour in each box. At a master class, he tries to construct a particular size of cube using all the cubes from just two boxes. But whichever pair he selects, he finds that at least one pair has too many pieces and all the other pairs have too few. Each different pair of boxes gives a different total of cubes and the largest total is 10 more than the smallest. With a stoke of genius, using all the cubes together, he creates instead a flat square, multi-coloured masterpiece! How many cubes (in ascending order) are there in each box? This puzzle is Enigma 1257 and the previous puzzle I published was Enigma 256, so there are now 1,000 puzzles left to publish (ignoring for the moment that sometimes multiple puzzles are published under the same number, and that I’ve already published Enigma 1095). Which means just under 44% of all Enigma puzzles are now available on the site. “Care for a flutter?” Alf asked Bert. Which coin gives the crafty Alf the best bet? This puzzle brings the total number of Enigma puzzles on the site to 780. As the final Enigma was #1780, you might think that means there are 1,000 puzzles left to publish. But at Christmas time, especially in the 80’s, multiple puzzles were often published under the same number. (Also, I’ve so far come across three puzzles that are duplicates of already published puzzles). So, my current estimate is that I will need to publish around 1,788 puzzles to have a full archive of Enigma puzzles, so it’ll be a couple of weeks before there are around 1,000 puzzles left to go. There are now 763 Enigma puzzles on the site. There is a complete archive of all puzzles published from 1979 – 1983 and also from 2004 – 2013. Which is about 43% of all Enigma puzzles, and leaves just over 1,000 to add to the site. Enigma 1335: I know where you live! Of course the most challenging problem of 2014, but certainly not the most fun, was getting a phone line and internet service at my new house. But I did manage to keep up with the posting schedule (although somewhat erratically) during the 3 months that I was without internet access. Thank you to everyone who has contributed to the site by adding their own solutions (programmed or otherwise) or their insights and questions. Here is the 2014 Annual Report for Enigmatic Code created by WordPress.